Warm sunshine, grand seascapes, all that fresh air… there’s something completely rejuvenating about a stay by the seaside. So just imagine being able to escape to the coast whenever you choose. From long lazy weekends to month-long retreats, a holiday home at Looe Bay lets you take time to enjoy the simple pleasures. 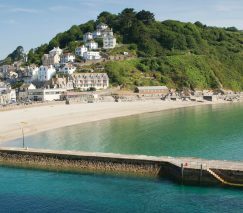 Like the traditional charms of the seaside – Looe with its beach and pretty cobbled streets is just a mile away. Your new lodge-style retreat is the perfect base to explore Cornwall’s stunning coastline. It comes fully equipped with modern conveniences and cosy features for a true home away from home feel. It’s the laid-back lifestyle you’ve been dreaming of. Whether you’re looking for quiet seclusion or regular adventures along the coast, Looe Bay provides a new, more leisurely way of life. Every day’s a beach day with large stretches of golden sand close by. From pretty Polperro to delightful Looe, quintessentially Cornish harbour towns are moments away. Leave the everyday behind and lose yourself in Looe Bay’s quiet, countryside setting. An on-site heated swimming pool, 9-hole golf course and adventure playground build the best family memories.